We want to be comfortable in the house. There is a narrow band of temperature and humidity range we human beings are comfortable at. 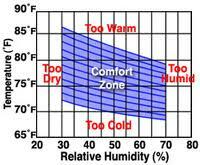 The temperature-humidity chart below show the comfort zone to be in the low 70’s to 80 degrees Fahrenheit, which is about the ambient temperature in Hawaii. 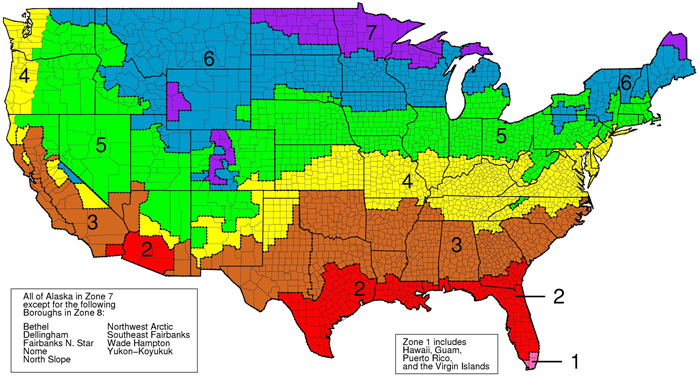 Since less than 1% of the population of the U.S.A. live in the 50th State most of us encounter climates where the outdoor temperature is either too warm or too cold. So to keep the inside of the house comfortable the shell of the house would need to slow down the transfer of heat between inside of the house and outside of the house. This (either keeping the interior cool when it’s blazing hot outside or keeping the interior warm when it’s frigid outside) is what insulation does. 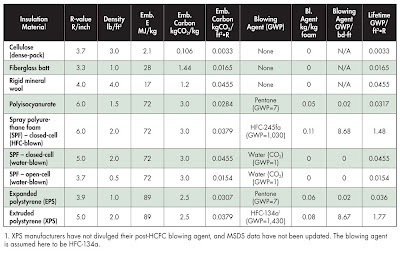 What type of material to use for insulation and how much to use depends on where you live and the goal you’re trying to achieve (performance and cost). US EPA’s Energy Star site has this insulation map and accompanying table that shows different climate zones and the recommended level of insulation. You’ll notice numbers preceded by “R” on the table such as R30, R25, R60, etc. The R-value is the unit of measure for resistance to heat flow. The higher the R-value the less heat flows between the inside and outside of the house. Different materials performance as insulators and you can find a table of R-value for different materials in this Wikipedia article. Rather than use a generic table of recommended R-values we had our Passive House consultant and designer, Graham Irwin, perform the analysis and calculation using the Passive House Planning Package (PHPP) from Passive House Institute. When all the details of the house (climate data for our zip code, house orientation, materials used etc.) are entered into the PHPP software it will calculate the amount of energy needed to heat and cool the house. We have specific energy target we want to achieve for heating the house to meet passive house standard: 15 kWh/square-meter/year or 4.75 kBTU/square-foot/year. The same target exists for cooling demand for the year but since we live in a temperate climate that doesn’t require air conditioning it’s not a big concern for us. Using the insulation specifications below our heating demand for the year to keep the house at comfortable temperature of 68-degrees Fahrenheit (20-degrees Celsius) is 8.75 kWh/square-meter/year. We had many discussions with the insulation experts, contractors, energy efficiency specialists and architects before deciding on the materials we chose. One key learning for us was when we heard Alex Wilson speak at PG&E’s Pacific Energy Center in San Francisco. He shared a story of a well-intentioned homeowner wanting to save energy and reduce greenhouse gas emission was horrified to learn that the spray foam product he used to insulate his house would take 60-years to payback — this is not financial payback but the time it would take his energy savings to offset the amount of greenhouse gas released into the air from the blowing agent used for his spray foam product. So we decided to stay away from spray foam products. 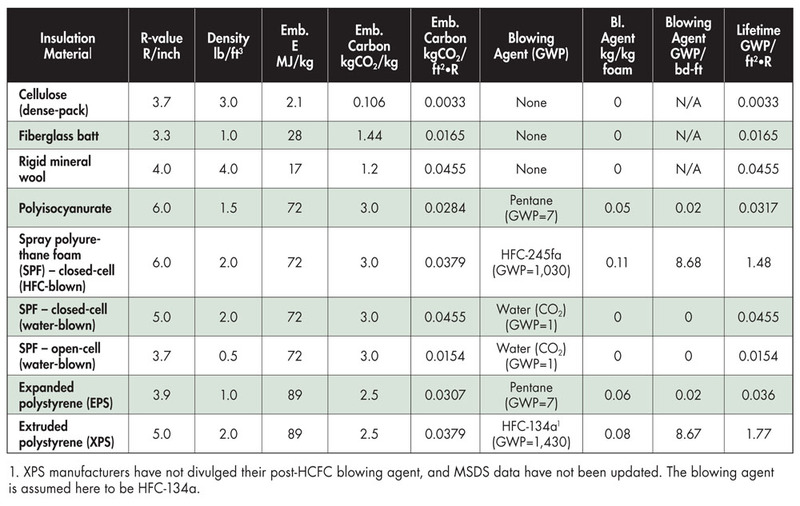 You can find one of Alex Wilson’s article on insulation at Green Building Advisor. The chart below is from that article. Here are some before and after picture of our attic. You can see from this “before photo” that we did have some attic insulation, if only to barely cover the ceiling joist. In this “after photo” you can see the measuring tag sticking up from the sea of cellulose to indicate that between 12 and 14 inches of cellulose filled the space. The insulation sub-contractor, Ponzini Insulation, did the cellulose insulation in the attic and in the wall cavity. Applying blown in cellulose in the attic. They had a big truck with special attachments to pump the cellulose through the long hose to apply the insulation. 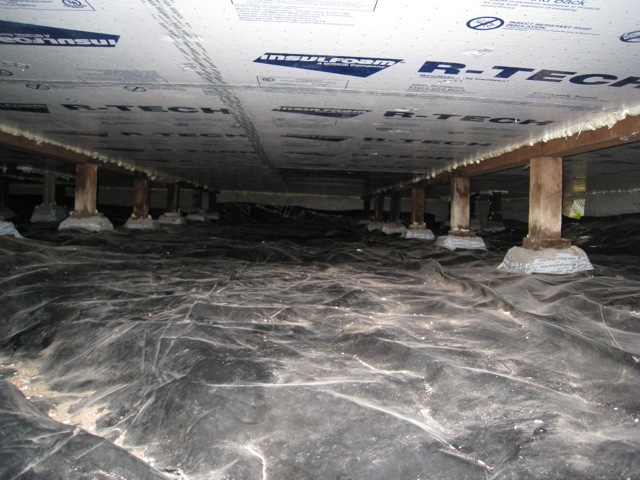 Crew from Santa Cruz Green Builders did the insulation and air sealing below the floor in this cozy crawlspace. Fiberglass batts filled the 5.5-inch deep cavity between the floor joists. Then sheets of 2-inch thick EPS board was applied under that. The seams of the EPS boards were meticulously taped using Siga tapes. Because the EPS board serves dual purpose of insulation and air barrier the edges of the board coming in contact with other material (wood, concrete) were foamed to prevent air leakage. Our 90-year old house did not have any wall insulation! As you can see from this deconstruction photo, the space between the exterior skip sheathing (horizontal board) and the interior wall made of lath (small strips of wood) and plaster was empty. Wet spray insulation was applied to the open stud bays in the interior wall cavity. This took almost one week to dry fully but it allows for visual inspection of cellulose application. Speaking of inspection, we had Quality Insulation Inspection (QII) performed by Bright Green Strategies for the California Advanced Homes rebate program. Sheets of rigid mineral wool were applied to the exterior wall.